at the new bus stop in Laskey Car Park. O'DRISCOLL Coaches has announced that its New Norfolk bus service, Derwent Valley Link, will start using the new bus stop in Laskey Car Park from next Monday, October 6. 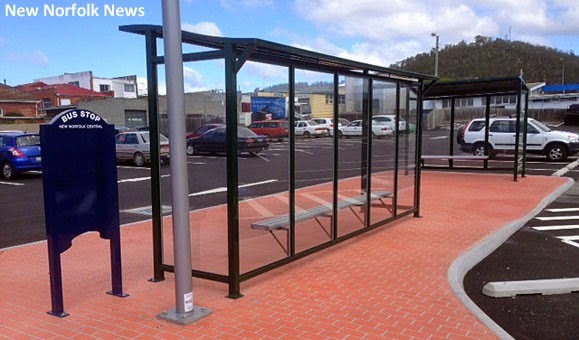 Describing the new bus stop as "New Norfolk Central", the company says this will replace both stops in Burnett St. All inward and outward services will pick up and drop off at Laskey Car Park. The bus company has also announced that additional bus stops will be placed in George St near the intersection with Burnett St.
parking spaces for the disabled. Are they stopping in the car park, or in Pioneer Ave alongside the car park? Hi Simon, the idea is that they will stop alongside the bus shelters in the car park. Readers are welcome to let us know how it works out.